Yesterday night I did this drawing of the Novo Museo Tropical inspired in Japanese Landscape drawings, with the result being in Oriental Tropical style. I'm still not sure of how the architecture of the Museum is. I only know it has a concrete roof (in which you can also walk), no windows or enclosed spaces (although some spaces might be closed with mosquito nets). The roof is mostly supported by pilotis (from which you can hang hammocks), or there could also be monolith free standing concrete walls, creating some kind of labyrinth. Because it's located somewhere in the tropics, in the future the Museum will probably be covered by the jungle and disappear. In one of the free standing walls (or maybe on the floor) the plans of the museum will be inscribed in concrete, to allow future archeologists, if they wish, to reconstruct the museum. I have also been thinking seriously about the contents of the museum, which art works would exist there, and how they would survive the climate. Apart from temporary exhibitions (in Kippenberger MOMAS style), and of works of art that required no technology and could survive the weather (and age with it), there might be no works exhibited in the Museum. In the past, I had been thinking of some works which would definitely have to be part of the Collection, for example, Dominique Gonzalez Foerster's 'Promenade' from 2007, where the space is filled with the sound of rain, or Oswaldo Macias 'Something Going on Above my Head' from 1999, where the space is filled with the sound of birds. As much as I love this works, at the moment they wouldn't be needed in the Novo Museo, as these sounds and effects would happen outside the Museo naturally (unless a catastrophe occurred where birds and rain disappeared and we would need to resort to the recordings to remember them). As such the Novo Museo Tropical would be, in Dominique Gonzalez Foerster's words "a place to observe, enjoy and describe the effects of tropicalization", (in DGF, SET: Sitio Experimental Tropical). I've also been thinking on the collection of the Novo Museo. Some of the works or artists that could form part of the collection form part of the Diagrama Tropical. But maybe these works don't exist inside the museum in the physical sense. Maybe information would be available about the works in the museum's "library", and there would be an Instruction Manual/Time Capsule, which would allow for the works to be recreated at present time, but also reconstructed in the future. There should also be some kind of alphabet/code to allow for future inhabitants of the planet to decipher and read this instructions in order to reconstruct works and museum, should human kind as we know it disappear from the planet. 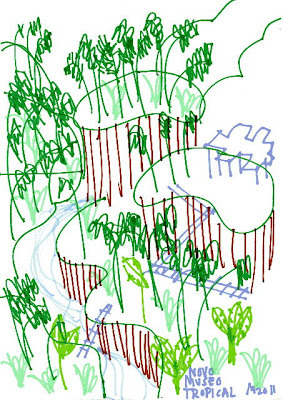 Read here the Novo Museo Tropical Manifesto. Like. This is beyond brilliant. Contact me about location scouting in Bali please.